German light bulb maker LEDON enlisted Japanese designer Ryosuke Fukusada to create the impossible- a light bulb made from wood. Fukusada created the illusionary lamp by wrapping an LED bulb in a thin layer of pine. The resulting bulb looks solid when off, but when switched on, a warm glow shines through the wood’s natural rings and markings. At first glance, Fukusada’s light fixture looks like a piece of wood hanging from a wire, the texture and rings of the wood visible on the bulb’s surface. 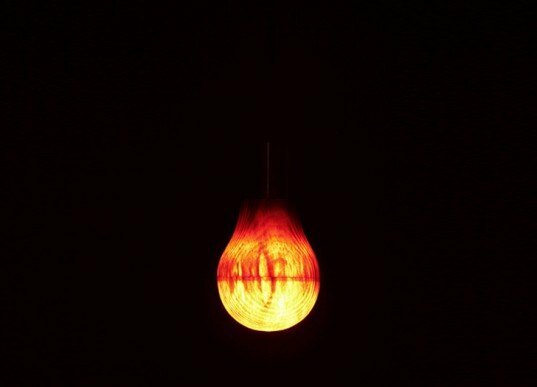 But with a flick of a switch, the LED bulb glows from within, casting a surprising red glow from the fibrous pine encasing. The trompe l’oeil bulb is actually a very snug lamp shade, handmade by Fukusada, who used an artisan wheel to spin the wood while carving fine curves in the surface, enabling the wood to be manipulated into rounded shapes. This traditional technique is called Rokuro. Choosing pine veneer as his medium, Fukusada then carefully shaped the wood with a special knife, reducing its thickness to less than 1/10 of an inch. This thin casing was then fitted over the LED bulb, and connected to the electrical components. The resulting lamp fills viewers with wonder, adding a quirky centerpiece to any room. 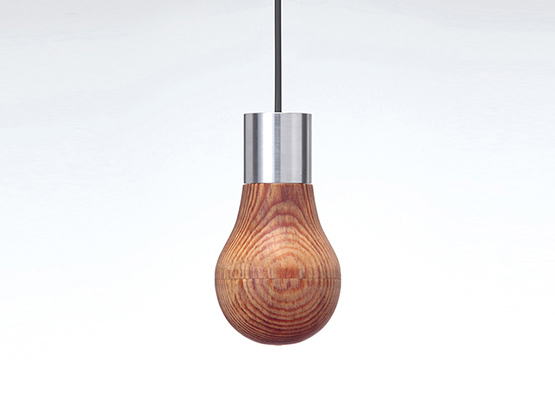 But the mystery doesn’t come cheaply- LEDON is retailing the wood LED bulb for $2,700.